Patients in Israel face disparities in waiting times for medical care based on hospital location, hospital ownership, and payment type (public versus private). These gaps demonstrate, to a great extent, the current challenges facing the Israeli health system. 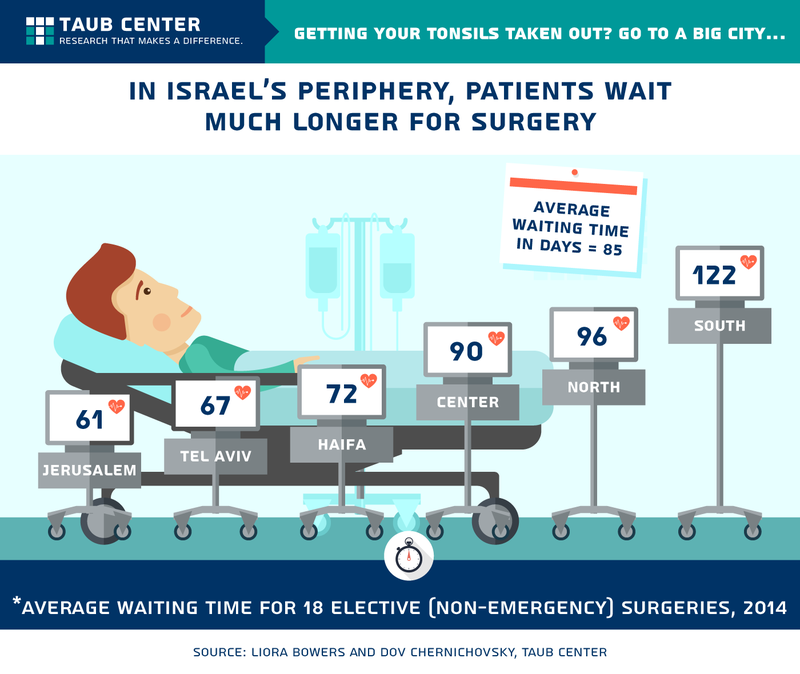 A recent Taub Center policy brief finds that within Israel’s public hospital system, there is a large variation in the length of time patients must wait for elective (non-emergency) surgery. The study, conducted by Taub Center Director of Finance, Operations and Policy Analysis Liora Bowers and Taub Center Health Policy Program Chair Prof. Dov Chernichovsky, discusses the relationship between the length of waiting times and three factors: hospital location, hospital ownership, and the system of care (public or private). Israel’s National Health Insurance Law (1995) established that every resident is entitled to receive healthcare within a reasonable period of time and at a reasonable distance from his/her place of residence. To date, no guidelines have been set regarding “reasonable time or distance,” and this remains a big challenge facing policymakers in the field of healthcare in Israel. Waiting times for medical care can serve an important function in a system where health costs are largely subsidized by the state, such as in Israel. One concern in such a system is that consumers may overuse services because they do not directly feel the financial burden of doing so. Consequently, waiting times can be a mechanism for rationing care and preventing abuse of the system. However, long waiting times for emergency and urgent procedures can lead to deterioration in the patient’s condition, and long waiting times for less urgent procedures can negatively impact the patient’s ability to work and quality of leisure time, as well as their confidence in the public health care system. While community health care is quite good in Israel, with short waiting times for doctor’s office visits and high patient satisfaction, the problem of long waiting times is prevalent within the hospital system. Between the hospitals with the shortest and longest queues in the country, there is more than a year difference in waiting times for knee replacement, tonsillectomy, and deviated septum surgery. Hospital location and ownership, and public or private insurance all contribute to how long a patient must wait for treatment. Waiting times in Israel vary greatly by region. The large metropolitan areas of Jerusalem, Tel Aviv, and Haifa have the shortest waiting times for elective surgeries in general, while the peripheral areas – the Northern and Southern districts – have the longest. The longer wait in the periphery aligns with disparities in healthcare resources, such as the number of available hospital beds. In Jerusalem, Tel Aviv, and Haifa, the supply of beds is the highest in the country, standing at 2.2-2.5 beds per 1,000 residents, and the waiting times are 15%-30% shorter than the national average. In contrast, in the Southern district, there are only 1.3 beds per 1,000 residents, and waiting times are about 44% longer than the average. Hospital ownership is another important factor in the length of waiting times. Bowers and Chernichovsky assessed hospitals in Israel’s metropolitan areas that are owned by non-profits, the government, or Clalit Health Services. They found that at hospitals owned by Clalit Health Services the median wait time is the longest – about 15% higher than the national average. There are various potential explanations for this finding. First, Clalit often steers its health fund members toward seeking care at Clalit hospitals, which limits their ability to choose among hospitals based on waiting times. Second, it may be that Clalit is more successful than other hospitals at limiting the impact of private funding on care, which may contribute to longer waiting times. There are two types of private health insurance prevalent in Israel – supplementary insurance sold through the health funds that is issued without consideration of a person’s underlying medical history and priced only according to age, and commercial private insurance. 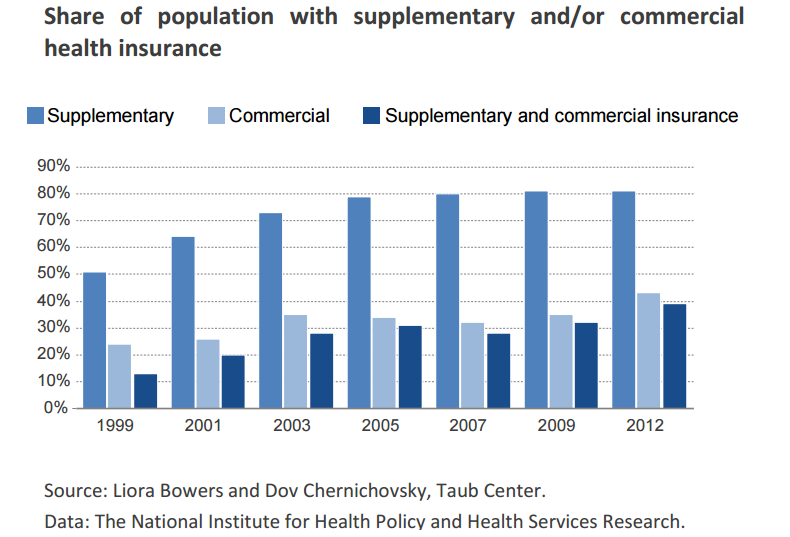 Between 1999 and 2012, the share of Israelis holding both types of private health insurance nearly quadrupled, standing at about 40% in 2012. This trend stems from, and reinforces, long waiting times in the public system. The private healthcare phenomenon may come from a feeling among Israelis that they do not receive effective or efficient healthcare in the public system. However, since both the public and private system rely on the same healthcare workforce, the existence of private insurance exacerbates the issue of longer lines in the public system, which pushes even more Israelis to private care. Israel is not the only country struggling with the issue of long waiting times. 23 OECD countries (including Israel) have stated that waiting times are an important policy concern, and 15 of these countries have developed strategic plans to deal with the challenge. As of August 2016, when Bowers and Chernichovsky published their findings, Israel had no such plan. In September of 2016, the Health and Finance Ministries launched a program to shorten waiting times in Israel’s public hospitals over the course of 2016 and 2017. Health Minister Ya’acov Litzman and Finance Minister Moshe Kahlon say the new plan will provide money for health funds to do more elective procedures in a timely fashion, and will result in fewer Israelis turning to private health insurance plans. As part of their study, Bowers and Chernichovsky discuss a number of policy proposals that address long waiting times for medical care in Israel. These suggestions include: establishing medically appropriate waiting time targets and incentivizing/penalizing health funds and hospitals to meet these targets; creating better integration between community care and hospital treatment; and providing payments to hospitals on a per case basis rather than a per day basis in order to incentivize treating more patients more efficiently. The researchers assert that a combination of transparency and the reporting of accurate waiting times data in real-time, alongside the commitment of the state to establish and help meet guaranteed waiting times, will help the general public manage its expectations, lessen uncertainty, and restore patient faith in the public system.